What are some freeways/highways that list a control city from two states over, completely ignoring the next state over? I'm aware of the infamous ones like New York for I-95 North in Baltimore and Miami for I-95 South in Virginia. I-10 East in Tucson uses El Paso, Texas, completely skipping over New Mexico. Arizona, along with Utah and Nevada are western states that are infamous for skipping over moderately-sized cities for controls and using a really far away major city. Las Cruces is where the I-10/I-25 split is located, but El Paso is only about 50 miles away and a much bigger city than Las Cruces. Although I-10 West in El Paso doesn't reciprocate and uses Las Cruces rather than Tucson. I-15 North in Las Vegas uses Salt Lake City and I-15 South in Salt Lake City reciprocates and uses Las Vegas, skipping Arizona. Although this is completely understandable, since I-15 in Arizona is only 30 miles and there are only very small towns on the route. I-95 South in Providence uses New York City, which skips Connecticut. However, I-95 North in New York City doesn't reciprocate and uses New Haven for I-95 North. I-80 in Ohio skips Pennsylvania and New Jersey and signs New York. I-57 south (primary control) is for Memphis in Illinois, completely skipping Missouri and Arkansas, and going past the end of I-57. I-94 in Michigan has a primary control of Chicago, skipping Indiana. I-80 in Illinois used to have a primary control of Toledo, east of Joliet, again, skipping Indiana. Now, the control is Indiana. In anticipation of the I-95/PA Turnpike ramps that opened late last September, many of the northbound signs for I-95 that once read Trenton were changed to read New York last summer... thereby skipping over NJ. I-64 in Louisville has St. Louis as a control city, skipping two states: Illinois and Indiana. I want to say there's at least one mention of St. Louis on I-24 south of the Ohio River as well, which would skip at least Illinois, but I couldn't find one when I quickly scanned Google Street View. In Hardeeville, SC, the control city changes from Savannah to Jacksonville, skipping over Georgia. STL is egregious because it's not even signed on I-57 so a morrist would have no way of knowing how to get to St. Louis. I seem to recall Duluth being signed on M-28 west of the US 41 split, skipping Superior and thus Wisconsin. End of I-195 in Providence has only New York as the control for I-95 S.
It's not on the mainline, but there is this sign on the NB road between US 45 and US 62. Roanoke VA is the control city for I-81 southbound in Hagerstown MD, skipping over West Virginia. When this was first posted in the 1960s (? ), Las Cruces was a much smaller city than it is now. The city population is over 100,000 and Doña Ana County probably adds that much more. Plus, being an Interstate highway junction, I think it is the next city east of Tucson that meets control city criteria. Yes, beginning at the US 68 exit. I-15 South from SLC uses Las Vegas, skipping over Arizona. 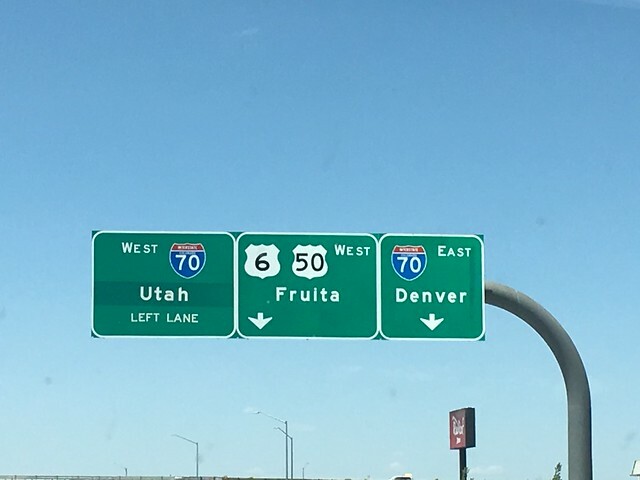 Similarly I-70 in western Colorado, skipping both UT and AZ (or at least the last time I was on that route!). I wonder if the growth of St. George (UT) will at some point effect a control-city sign change. See how "Utah" is on a greenout? That control city used to be Green River, a little town of less than 1000 most notable as the junction of US 6 and I-70! I know there are at least a few Las Vegas signs at some of the I-70 exits west of Richfield, but the bottom line on the mileage signs is "Jct I-15". Vegas is still much bigger and more famous. US 212 east in Montana goes from Broadus, MT to Belle Fourche, SD, skipping Wyoming. 212 west in SD does not do that, using "WY State Line" as the control city. US 95 south of I-84 in Idaho and north of I-80 in Winnemucca use Winnemucca and Boise, respectively, as control cities, skipping Oregon. Oregon, of course, uses "Jordan Valley" and "Ontario"
There was also at one time a New York sign on I-95 in NoVA. US 212 in Wyoming really does not go or connect to anywhere.